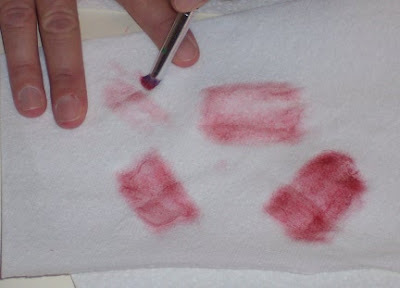 For an upcoming issue of Altered Couture I have written an article about using Shiva Paintstiks. A few wearable art items will appear with the techniques article. 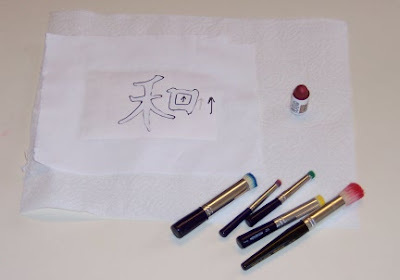 To supplement that article, here is an on-line tutorial with pictures illustrating the steps to perfect Shiva Paintstik application!! 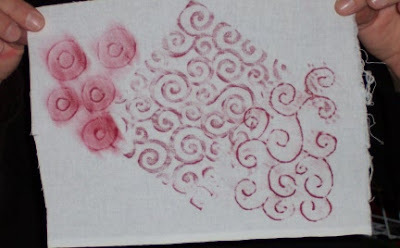 I like to use freezer paper stencils. 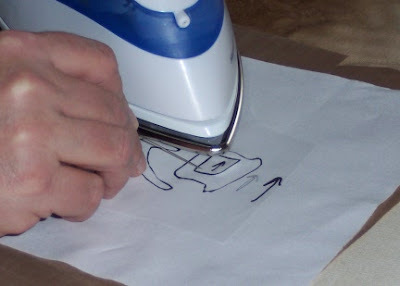 Trace your design onto the paper side of freezer paper. Cut out the design. 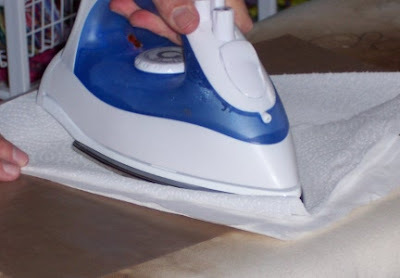 Iron the freezer paper stencil to your fabric. Fabric should be prewashed and dried. 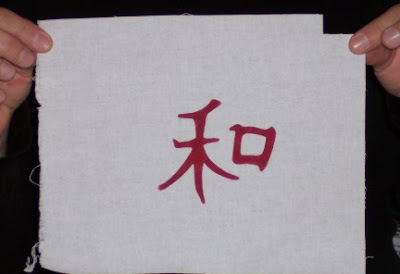 The arrow is my registration mark for this Chinese character PEACE. 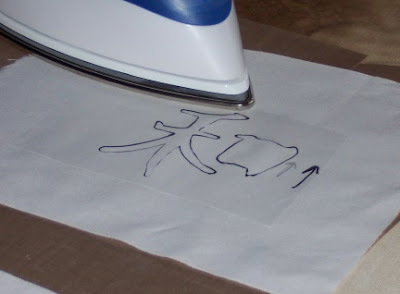 And here I am ironing in the square in the center of the second character. I've moved to the kitchen counter so I have a firm surface to work on. See my stencil brushes? These are dedicated solely to the purpose of Shiva Paintstiks. I store them in a zip top plastic bag. Shiva Paintstiks form a protective skin which prevent them from drying out. There are many different ways to remove that skin. Being somewhat of a skin thrift (get it? spend thrift, skin thrift), I like to peel away the skin using my thumbnail and a paper towel. 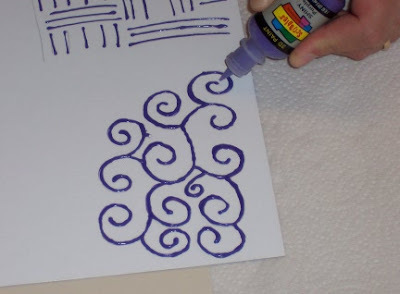 Once the Paintstik is exposed, I swirl my stencil brush on the tip of the Paintstik to load it with paint. 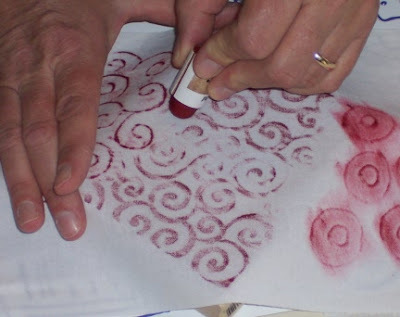 Next gently swirl the stencil brush on your stencil. You will have to reload your brush with paint a few times. Some say you need to use solvents to clean your brushes. Not me, I'm way too lazy to get those out. I just rub the paint off onto a paper towel. You can see how in about 4 squares, the paint is mostly off the brush. Then I pop the brush back into the baggie. I've been using these same stencil brushes forever. 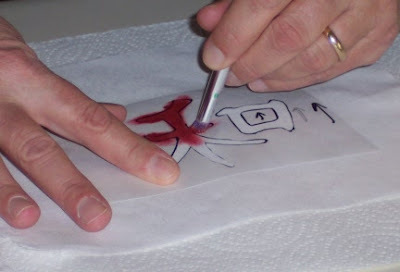 Once you are done, place your piece in between layers of paper towels (one on top, one on the bottom). Iron for a minute or so. This lets all the paint sink into the fabric. You still have to air dry and heat set the Shiva Paintstiks after 3-5 days. The moment of truth. Peel away your stencil (and save for another day). . .
And the reveal. There is is. Perfect in every way. Soft and flexible. Washable, but NOT dry cleanable. Put out to dry for 3-5 days and then heat set by ironing. I usually iron for 2 minutes. Have never had a problem with fading. Rubbing plates. I don't like those commercial plastic ones, though some use them with great success. Too slippery. So I make my own rubbing plates. You need a piece of cardboard and a bottle of dimensional fabric paint. If you are in a hurry and you can't wait for the paint to dry (overnight), then you can use a hot glue gun. 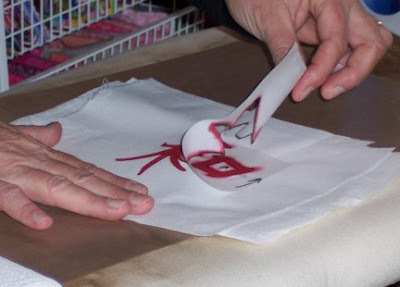 Using the dimensional paint, draw your design on the cardboard. Set aside to dry overnight. 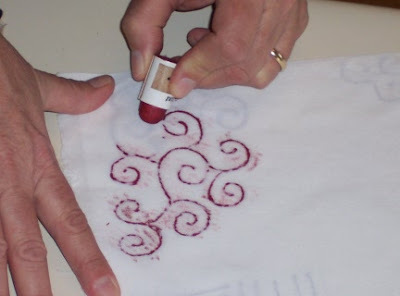 Place your fabric over your design and gently rub with the Shiva Paintstik. And there is your design. I like the dimensional paint because it is slightly rubbery and doesn't let the fabric slide. The stencil brush is not in the picture, but here I've used the stencil brush over my rubbing plate for a different look. 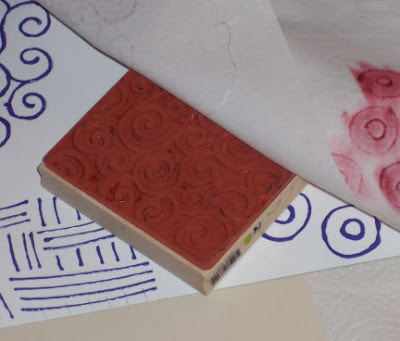 Rubber stamps make nice rubbing plates too. Don't use ones with many small and fine details, they just get lost. 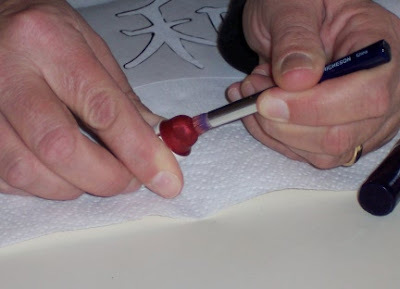 Place your rubber stamp underneath your fabric. Rub with your Shiva Paintstik. 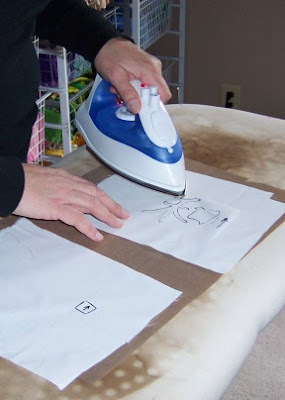 Place your finished rubbing in between layers of paper towels (one on top and one on bottom) and iron. 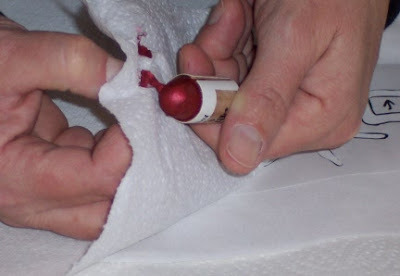 This lets the paint sink into the fabric. Let air dry for 3-5 days and then heat set again, ironing 2 minutes. Voila, three different types of rubbings. Thanks so much. I had no idea what to do with them so I never bought any. Now you've goosed my muse. Thanks for taking the time to share your knowledge. Great tutorial! I now want to go right out and get some Shiva paintsticks. The colours are luscious. What wonderful pictures! 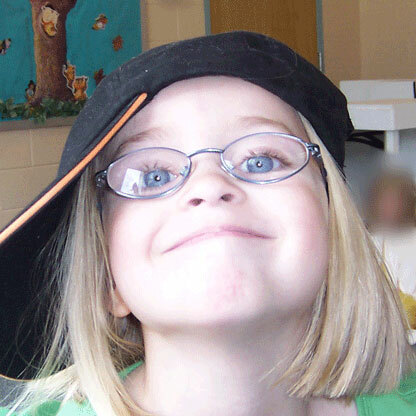 Who was your photographer?? No really, what a generous teacher you are! This is clear and just chocked full of information. Thank you for sharing. I have just started using these paintstiks also. What fun they are. Thanks for sharing, my friend in Iceland told me about Shiva paintsticks on fabric, and now I know exactly what she means - woohoo! Must try! Lovely clear instructions. Thank you so much for sharing this! 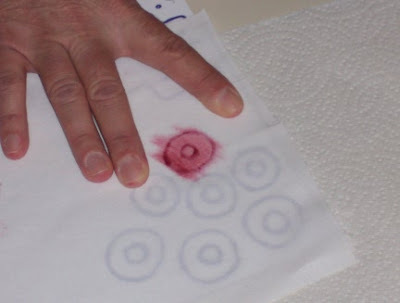 I'm embarking on a quilt project and I want my marks to be washable - now I'm armed with all the right information. 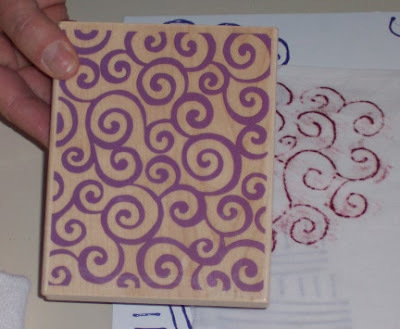 You can reuse the freezer paint stencils? I've been throwing mine out.